Recipe by Julia Zouev. Photography & styling by Tanya Zouev. 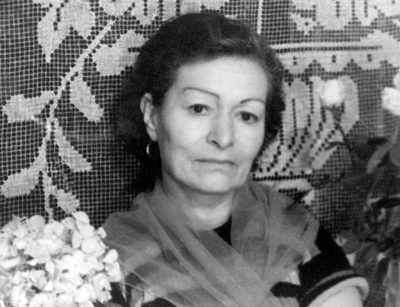 My grandmother was a feisty Russian lady whose name was Zinaida Vassilyivna Moullova and she came to this country in 1958 with my parents. Never one to hold her opinion or tongue, she always said it how it was, and when one was spoken to this manner (in Russian) it could be rather harsh. She never learned to speak English but for a few words: hello, thank you and goodbye. But then again sometimes, you don’t really need much more. I never knew a great deal about her life other than that she was born in St. Petersburg into a well-to-do family in Pre-Revolutionary Russia. She went to a school for aristocratic ladies, though from the snippets my mother has told me about her, sometimes she behaved anything but. She didn’t have a particularly easy life however from the sounds of things it was an interesting one spanning three countries (Russia, China and Australia) and over nine decades long. My mother says that Babushka was a no-nonsense cook who never experimented, only cooking what she knew well for most of her life. Mum remembers these eggplants on the dinner table when she was a little girl growing up in a Russian settlement in North China, a city called Harbin. This was a place where many White Russians settled after fleeing the Bolsheviks during the Russian Revolution of 1917. (A White Russian was the term referred to any Russian who supported or was affiliated with the tsar in the 1917 Revolution and the Russian Civil War which followed in 1918–20.) According to my mother, the Russians (and the many Jews, Poles and Slavs) made Harbin quite the cosmopolitan city it came to be known as before the mass exodus of the late 1950’s, when the Chinese government ordered everyone to leave. This vegetarian eggplant dish is influenced by Georgian cuisine and is one my Babushka loved to make and my mother very much enjoyed as a child. (The Georgians love their eggplants so much it is practically their national vegetable.) 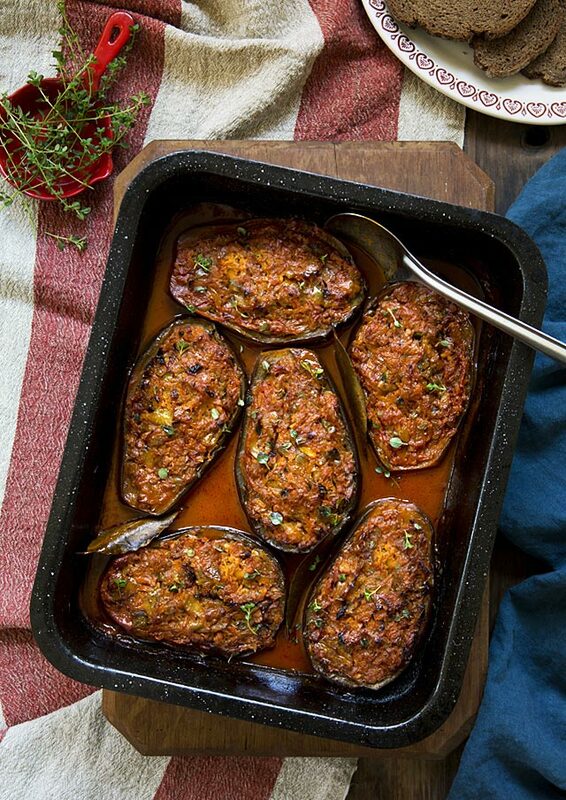 The flesh of the eggplant is first scraped out with a spoon, mixed with other vegetables and cooked, then the mixture stuffed back into the eggplant shell and baked in a delicious tomato sauce. Filling and rich, it is a meal in itself and can be eaten hot or cold with some tangy plain yoghurt (I like to eat this dish with thick sheep’s yoghurt and crusty bread). Babushka died in 1998 when I was 27, a month shy of her 96th birthday. If she were alive today, she would probably still be asking me to stop “thinking so much”. But if I were any other way, I wouldn’t be constantly thinking of all the wonderful things I’d like to cook, the pictures I’d like to take, or all the things I’d like to say. You see, that’s why I started The Cook Who Knew Nothing and with any luck, Babushka might have understood this, and maybe even approved. Serves 4 as a main, or 8 as a side. Prep time 30 minutes, cooking time 90 minutes. 1. Preheat oven to 200˚C (approx. 390˚F). 2. With a spoon, scrape out the flesh of the eggplant halves, chop it roughly and set aside. Place the hollowed out eggplant halves in a greased baking dish, season them and drizzle with olive oil. 3. Place a fry pan over medium heat, pour in the olive oil, and cook the onion until soft and translucent. Add the eggplant flesh, garlic, grated carrots, parsnip and green capsicum and cook for a further 10 minutes (the vegetables will soften). Add the tomato paste, bay leaves, thyme, maple syrup and seasoning and cook for another 25-30 minutes. 5. Cover with foil and bake for 30 minutes. Uncover the dish and bake for a further 30-45 minutes. The dish is ready when the eggplants have softened and the sauce has thickened (it should not be watery). 6. Let rest for 30 minutes before serving as the eggplants will absorb more moisture and the sauce will thicken a little. Or refrigerate when cool and eat cold the next day (the flavours will be even better). My vision for this shoot was modern rustic so for this image so I teamed vintage enamelware with contemporary linen. My Babushka would have cooked these eggplants in exactly the same type of baking dish (her kitchen was full of enamelware) and I found this one in a local Vinnie’s store. The vintage plate and tiny red enameled pan are also from my local Vinnie’s, a sorting depot with more wonderful junk than you can poke a stick at. The vintage board and spoon were reclaimed out of a hard rubbish collection and the linen is by Iveta Sarta, a wonderful linen seller from Latvia. The only light used in this image is window light. Hi Jen, lovely to see you here again. These eggplants are really good and the recipe lends itself to further tweaking with spices if you wish to adapt it to your husband’s tastes. I’ve been working on our family recipes for months now, firstly making sure I can cook the original really well before I venture into modern adaptations of them. There will be more zakuski appearing in a few weeks, then who knows what else? Happy cooking, Tanya. Stunning presentation – pinned! I love everything eggplant! I grew up eating so called “eggplant caviar” – one of my all time favorites. The pictures look great and it sounds delicious! I made this last night and it was delicious! Thanks for sharing your Babushka’s recipe. I’ll be following you for your amazing photography as well as your great food! This was sooo good. I didn’t change a thing, served w/ brown rice. Great recipe and loved the story of your grandmother. Hi there! I absolutely love eggplant and can’t wait to try this dish! I am not able to find capsicum peppers and not sure of another pepper they are similar to…can you make a reccomendation, please! I honestly don’t know what you could substitute for capsicum as it has such a unique flavour. You could try banana peppers perhaps? What a wonderful tribute to your babushka! I absolutely loved reading it and was quite surprised to learn about the Russian settlement in Harbin! You family history sounds fascinating, Tanya. I am going to try this eggplant recipe. I love Georgian cuisine, it looks delicious!